Here’s a confession: I love fried chicken. I prefer fried chicken over a hamburger any day. And not just any fried chicken but one that’s well-seasoned but not too greasy. I’ve had KFC, San Diego Chicken Pie Shop, Ralph’s, Albertson’s and Louisiana Famous Fried Chicken but other than making it myself (I’m fry-phobic), I always turn to Popeyes Chicken and Biscuits when the craving hits. 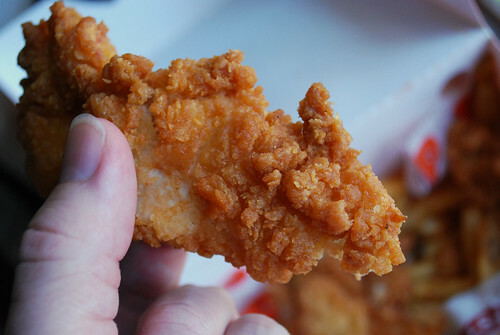 At some Popeyes, there’s a special offer every Tuesday: a thigh and leg for only $1.49. Whatta a deal! 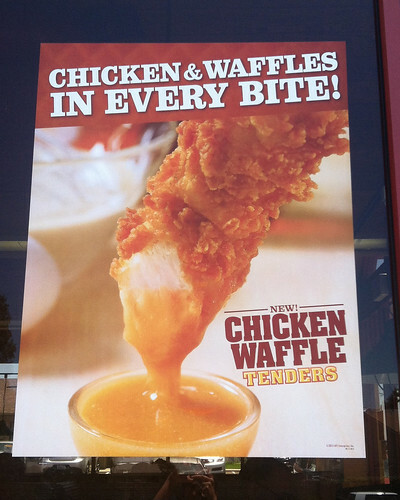 So it was during one of my Tuesday chicken runs that I saw a tease for an upcoming special, Popeyes Chicken Waffles. Immediately my thoughts turned to chicken and waffles but later signs clarified Chicken Waffle Tenders which launched this past July. The skeptic I am, I had to check these out. 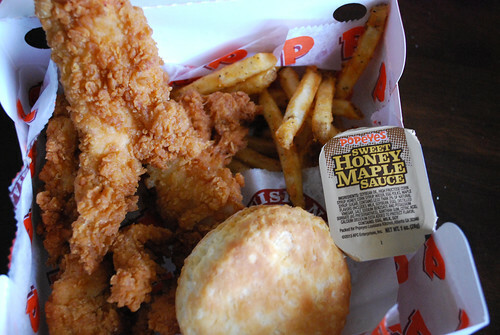 Could Popeyes have possibly improved on my beloved fried chicken? Yes, they did. The signs touting the Chicken Waffle Tenders promises waffles in every bite. Instead of using their regular batter, the chicken tenders are battered and rolled in crushed waffles. It’s a slightly sweet chicken crust but with an amazingly flaky and light. In the past I’ve avoided chicken tenders because they tend to be overcooked and dry but this was surprisingly moist. 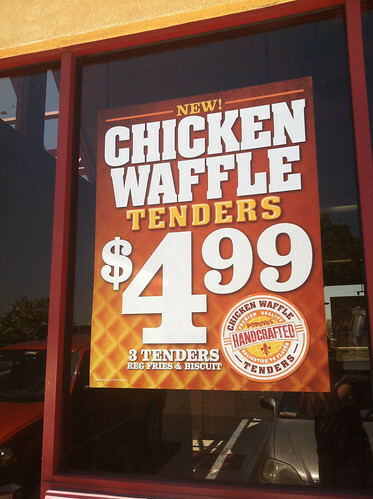 Unlike their other tenders, the Chicken Waffle Tenders only comes in mild. A shame because I love their spicy chicken. The regular meal for $4.99 (not including tax) comes with three tenders, a biscuit, seasoned fries and a packet of sweet honey maple sauce. 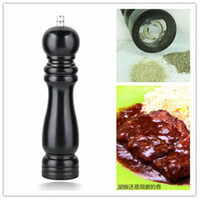 The sauce is an opaque ochre. For those who don’t like their meat sweet this may be too much for you, especially if you consider the already sweetened chicken crust. I initially disregarded the sauce but grew to love it after a few bites and I wished there was more than one, lone container of sauce. The Chicken Waffle Tenders don’t replicate that chicken AND waffle experience, but it’s a good effort. My only wish is that the biscuit was replaced with a mini waffle but we can’t have everything. 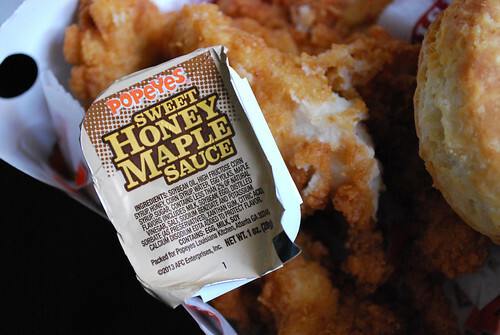 Like most Popeyes specials, this will only be available for a limited time and at participating locations. The sauce sounds kind of suscpcious but the description of the crust has sold me. 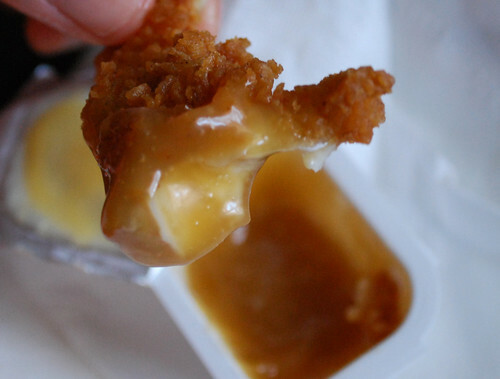 I wasn’t sold on the sauce until two bites in. At the very least, the chicken is worth a taste. I love fried chicken too. Good to hear that this is moist and not dry. I usually don’t eat chicken tenders but this surprised even me. I can remember when the Tuesday special was $.99 a few years ago! We would go every week, but we slowed down when it went up to $1.29. Will have to check out the chicken & waffles soon. Wow… I wasn’t aware it was so cheap back then. What a steal. I tried it for the first time on Monday. I was able to get mine spicy at the Mira Mesa location. They asked and I went for spicy. It really wasn’t that spicy though. But I loved them and I need to go back for some more! Thanks for letting me know they can do it spicy. I’ll have to check the Mira Mesa location (I usually go to the one in Tierrasanta.) I’m going to try to limit myself to having it only once a week. I read another article about this that pretty much had the complete opposite opinion that you did. And now, I’m really curious about it! I’m not super sure about the sauce… but the chicken does sound interesting. I bet little bit of spice in there wouldn’t have killed it. Yeah, I think taste is subjective. I think I may have read the same article. Granted, I’ve had Popeye’s spicy chicken (my usual) from other places and didn’t like it.